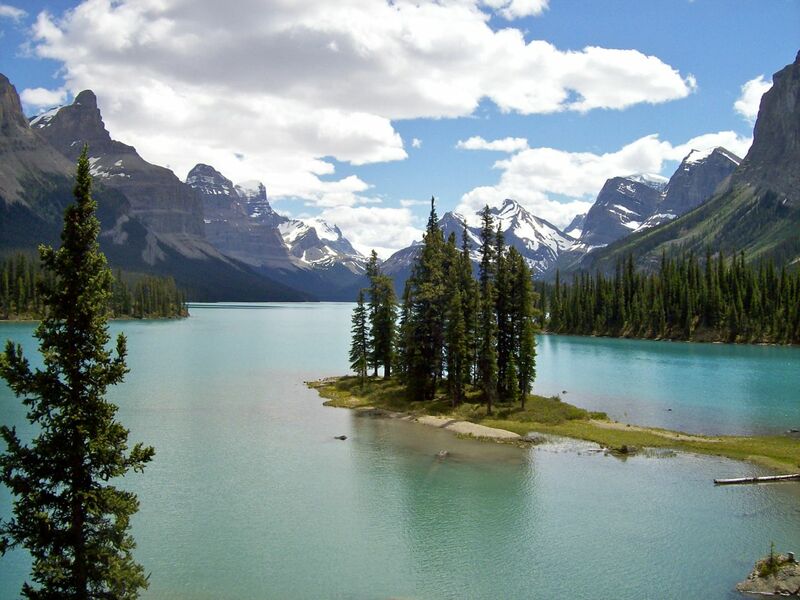 Everyone has their favorite National Park, but the one most near and dear to my heart is not in the U.S. It’s in Canada and it’s Jasper National Park where I just adore the valleys that expand from mountain to mountain in the Canadian Rockies. 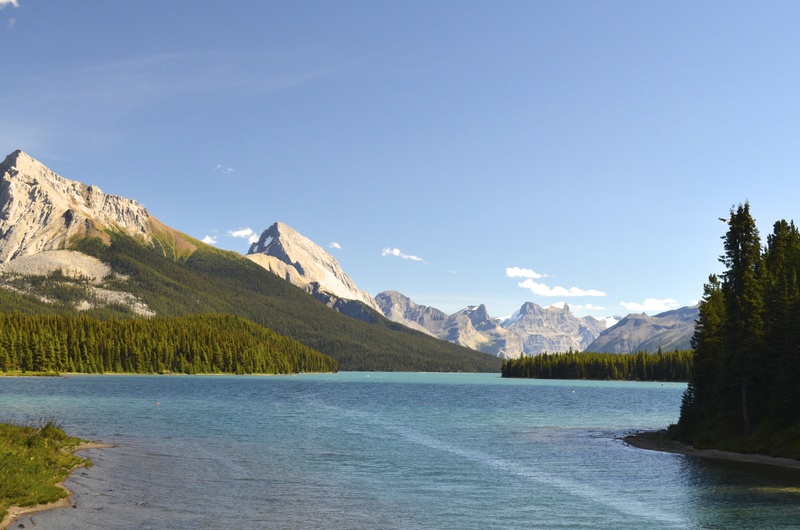 Yeah, Banff is beautiful, but Jasper stretches its arms wide open to receive you. But I wasn’t about to give up even if the light was in the wrong position, and the little fella was chirping, but making it clear that he was not about to make an appearance. What a tease. I just kept clicking and clicking, hoping that I would catch him when he’d pop out, and then finally—FINALLY—he jumped out and I got him. And he was kind enough to show me his cute yellow rump. 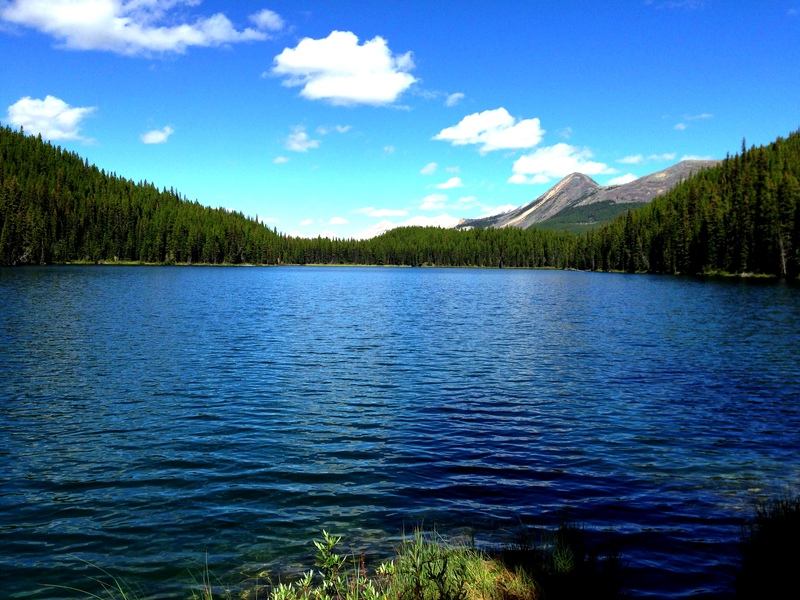 In Jasper we hiked to Mona Lake, which is near the Maligne Lake area. The skies were a bright blue with a few puffy clouds, and the hike was exactly what I needed to gain back my confidence (see my post on Pressures of Ecuador.) The trail wasn’t very busy, but a few birds were. And guess what, we didn’t have our binoculars. (Oh for Pete’s sake.) It really didn’t matter, though. The birds were shy and not cooperating. That was okay, though. It was a beautiful day for a hike, birds or no birds. When we reached Mona Lake we were the only ones there. It was peaceful. There was the silence of nature with no motor boats, no voices, no freeway sounds. Just a few Gray Jays. Wait. Gray Jays? That’s a new species for me. I tried to get a shot, but couldn’t get anything decent with my 300 mm lens. But that was okay. Our day’s goal wasn’t for birding, but just hiking. I turned around and there was the Gray Jay staring right at me. 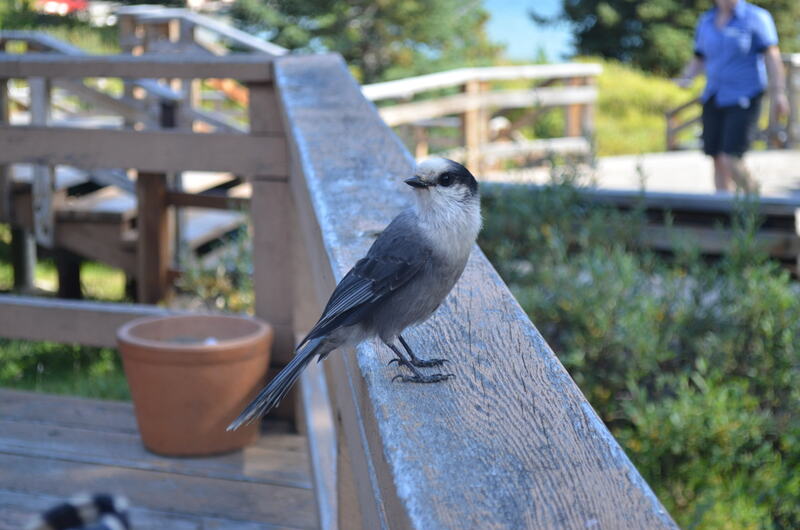 When we stopped for food at Maligne Lake it seemed as though the Gray Jays there were much more social than the ones we encountered on our hike. They were more like scavengers, but it didn’t deter them from being so darn cute. They still take my breath away and I’m always excited to see birds, whether the shy ones in the woods or their more extroverted buddies looking for handouts at a food stand. Later that day we had dinner at the Fairmont Jasper Park Lodge. The princess in me just loves the Fairmont properties, especially this one. It’s not to say that I don’t have fun or appreciate our adventures in the Amazon, jungles, or mountains with limited services, but I do love to be pampered a bit too. After dinner we sat on their Adirondack chairs overlooking Lake Beauvert and watched a male Common Loon–a new species for me–bring little fishes to a juvenile. 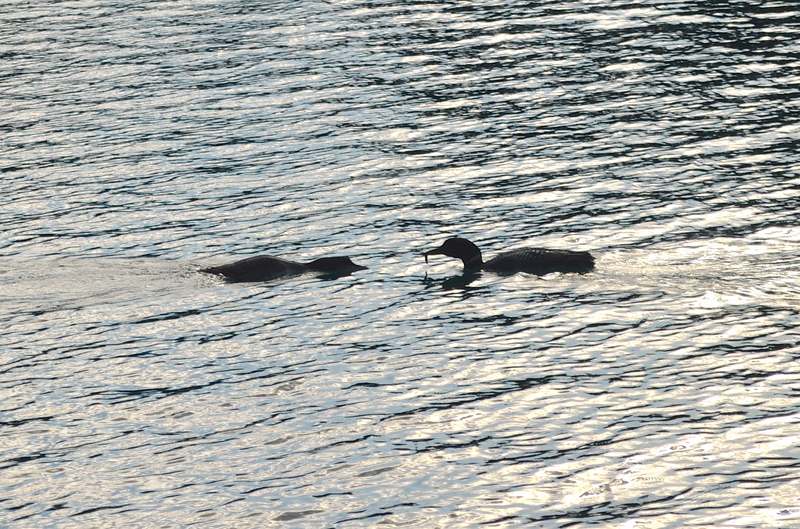 Not a fantastic photo of Common Loons, but cute nonetheless. So, there you go. Birding without binoculars. We still had bird encounters even without the gear. Certainly we didn’t have a big list, but that’s not what birding is about. It’s about having my breath taken away. And that’s why I love Jasper so much. I like the last picture especially (although the yellow rump was exciting). Thanks. I love that last photo too. Doesn’t the little warbler look like he sat on some wet paint? Gray Jays will land on your hand if you offer them peanuts. 🙂 I didn’t see any when I was in Jasper summer, but had Clarke’s Nutcrackers (a relative) hanging around some of the parking lots looking for handouts! Oooh, I wish I had carried some peanuts! Good to know! Oh wow… I just love terrain like that! So beautiful and (in my mind) it beats the African bush any day! 🙂 Congrats on nabbing your warbler! Thanks! I’m always thrilled when I nab a warbler. Oh the warblers – why don’t they want to come and hang with us Lisa? We have so much love to give them. LOL! 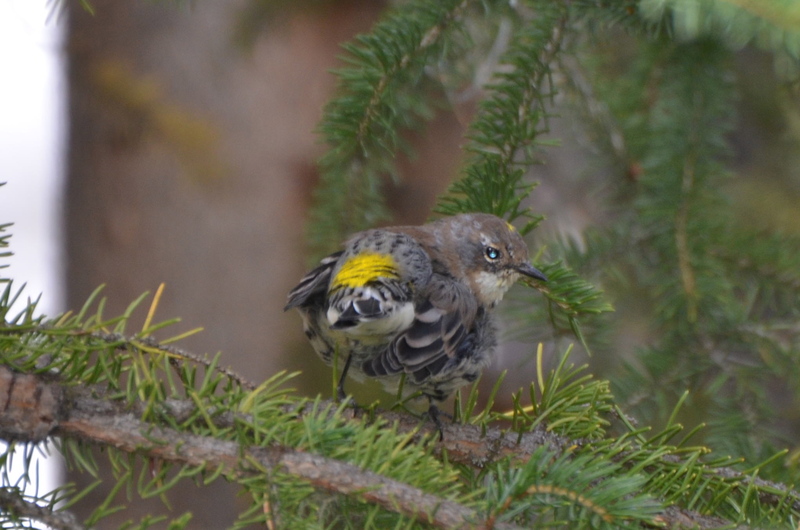 I was lucky enough to have a yellow rumped in my back yard this year. It actually let me take a few pics too. 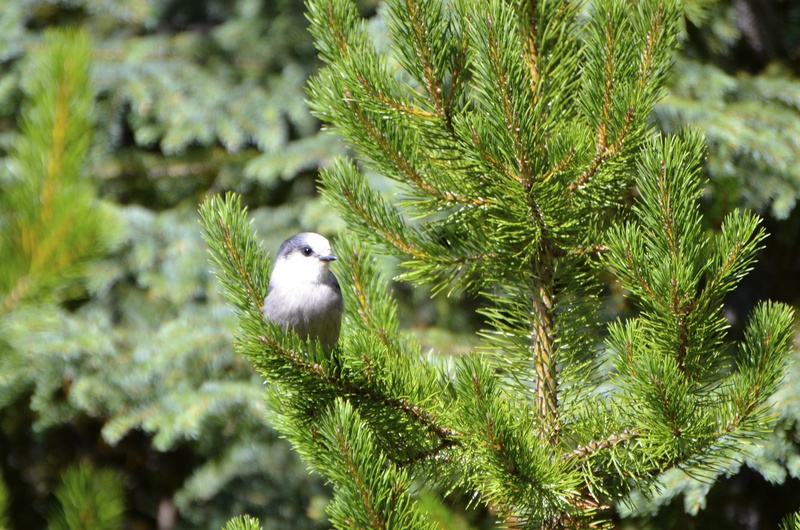 Happy you saw some Gray Jay’s too – I have only seen one before and would love to get a photo. Thanks for dropping by, Jenn. How is it that I just discovered your blog? Excited to read up on your adventures–in particular the bird adventures. My husband claims that we’ve had the yellow-rumped guy at our feeders at our Salt Lake City home but I don’t ever recall seeing the fellas. So I consider the guy I saw in Jasper a lifer. I am almost guaranteed to see something really neat when I forget my binocs. Worse yet, going for a hike without camera or binocs. So at least you had your camera to photograph that beautiful scenery, and a few birds as well.